G. Riley Johndonnell (a.k.a. Uncle Riley) is a conceptual artist and social activist who explores Optimism as a spiritual practice and as an art ‘Ism’ (just as Cubism, Modernism, Minimalism are ‘isms’). He believes that Optimism is a movement of creatives with the shared intention of positively impacting Reality. His personal and public works instigate transformation and challenge our perception of what is good/bad, dark/light, positive/negative. 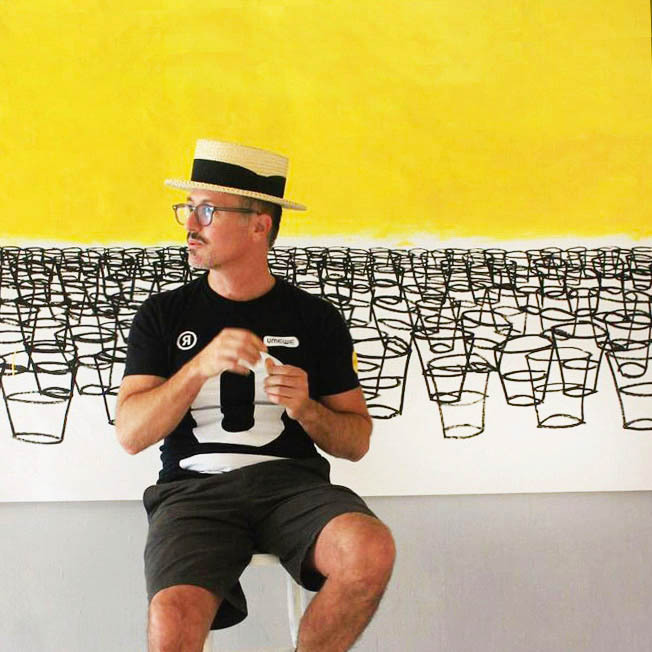 Johndonnell collaborated with Pantone Color Institute to create a signature color called International Optimism Yellow (‘INT-O Yellow’) as a platform for creatives to inspire more Optimism in the world. Over 1000 creatives, organizations and companies as well as two cities (Kingston, NY and Madison, NJ) have collaborated on INT-O Yellow. Johndonnell also co-founded UMEWE.org (‘you-me-we’) a social benefit company which creates tools and initiatives to ‘Turn Optimism Into Action’; each featuring ‘INT-O Yellow’ in some way. INT-O Yellow has evolved to become a color for mental health awareness (just as Pink is to breast cancer, Red is to HIV, Blue is to autism); it’s a way to collaboratively shine a light on the stigma surrounding mental health issues. Johndonnell creates civic works (under the alias “Uncle Riley”) in collaboration with the general public. Such works include daytime graffiti installations, interactive performances and videos, social media campaigns, the (P)optimism Shoppe, and more. Johndonnell is also the co-founder of Surface magazine (an influential international design publication). He shifted from a career in luxury branding, fashion, design and lifestyle publishing to focus on social cause and fine art. After two decades between San Francisco and NYC, and one year on the road in a vintage RV, he relocated to the Hudson Valley where he works with communities, creatives, government and organizations to create positive social change through art and design.